Another thing I learned not to do was to tell my mother any of my dreams I use to have because one such got me thrust into unwanted life changing situations. The dream told to her was that I was sitting in a swaying train that was pulled along by a steam locomotive engine through a forest of giant pine trees, opened up the train window, looked out and saw a large church with a high bell tower between two mountains. Peered inside the church and saw rows of school benches lined up from the front to the back. 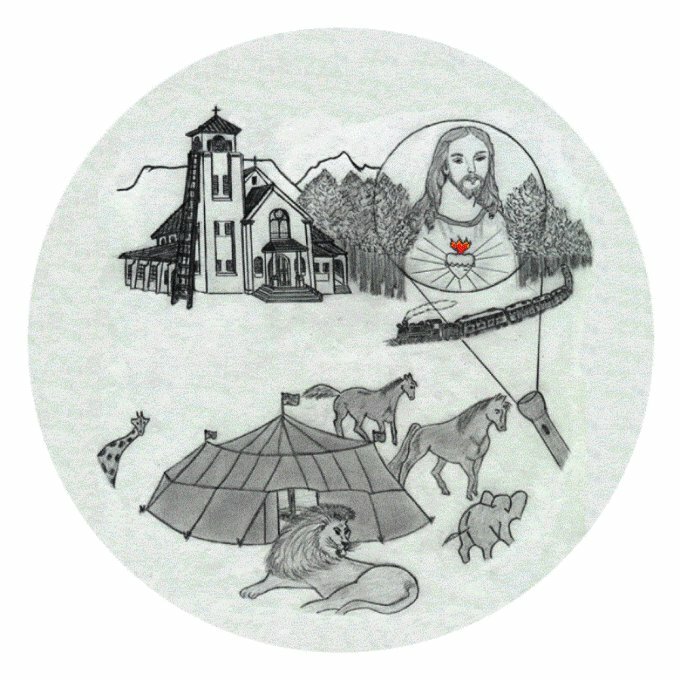 Then found myself climbing a long ladder propped against the church bell tower, and on looking down from the belfry saw a large circus tent with an elephant, giraffe, lion and horses roaming around. Floated down and found myself inside a circus tent in the center ring where clowns, acrobats and trapeze artists were sitting in the tier seats. The tent interior went dark and a picture of the Sacred Heart of Jesus appeared. As He said something incoherent to me my dad’s torch appeared in my hand, it went on and the torchlight focused on the picture. Now to me that was just a collective dream of happenings in my life, but not so to my mother. My telling of the dream of the Sacred Heart of Jesus in it to my mother lead to repercussions for me, because it then had to be related to relatives, neighbours and the clergy. They must have thought it was a religious experience, particularly Sister Gertrude who was the sacristan at our church, and it attributed to her initiating me to alter boy duties. She must have been really impressed, and the consequences saw her when any religious plays were staged to always cast me in the role of a priest or a holy person. Living that close to the church and in easy call to her seemed that every time the church bell tolled my mother was there with me in tow. I was altar boy come acolyte to daily morning masses, benedictions, baptisms, confirmations, first communions, marriages and funerals, and that was besides visiting the sick and dying. It had its advantages though because the presbytery housed three priests and each had their own church parish. Ours, Saint Theresa’s in Welcome Estate and Saint Joseph’s in Langa (Zulu = sun). Of the latter two I was picked up and taken by car by the priest of those outlaying parishes to assist at church services when altar boys were not available there. Those priests celebrated at marriages every week and I was a pageboy with a unique outfit for one of them. The jacket and pants were made of ivory colour silk brocade with the pants tapered to cutaway side bottoms and embossed white lace down the outside leg length. The jacket was waistcoat cut with pearl-buttoned front and the neck and sleeve cuffs had gathered embossed lace. White Spanish flamenco dancing shoes with large oval silver buckles, an ivory colour cane shepherds staff with a large white silk bow at the hook, which I had to lug around, completed the ensemble. My hair was also brushed up and hot iron curled into one long curl that went from the front to the back on the top of my head. That’s why the outfit and the pageboy were recycled for school concerts. My uncle Frank, my dad’s brother, fancied himself as a tap dancer because he did a routine at social functions, and just because through watching and imitating some of his steps he and my mother thought I had potential to carry it further. So coaxed by my pushy mother and coached by my flattered uncle they had nailed metal tips to the Spanish flamenco shoes fronts and heel backs before my feet had stopped tapping and I was on stage in my pageboy outfit strutting my stuff at a school concert. The accompanist tune on the piano was ‘Pine Tops Boogie Woogie’ and the appreciative audience towards the end of my routine threw coins onto the stage. That stopped my performance for I was picking up the coins instead. That caused concern for my mother, amusement for the audience and cheering and clapping from my friends. My mother made me empty out my pockets on coming off the stage and gave the collected money to the school principal, which of course was Sister Gertrude; nevertheless, on seeing my annoyance they gave me a few pennies to shut me up. In the course of time it also turned out to be a bribe because it became a regular thing at all concerts. My repertoire was extended to singing at concerts through the persuasive encouragement of my mother, especially the songs of Bobby Breen who was a child singer and the rage at the time, and today after all those years they still play his song I sung of ‘There’s a rainbow on the river.’ The audience still threw monies on the stage at my performances; on the other hand I was getting smarter as concerts went by and without them any the wiser I was slipping the higher serial currency into my shoes while bending down to pick the rest up. Being cast in school plays was the next step up the ladder for their success and it was situations of don’t say as I do, but do as I say. The first orchestrated by Sister Gertrude was a double dance and song routine called ‘Can and Can’t’ in which ‘Gus’ (Ronald Vanderbyl) and myself dressed as sailors did our thing. The routine lasted for the longest fifteen minutes with plenty of singing, heaps of dancing, and we even danced the sailor’s hornpipe. The making of our identical sailor outfits though lead to a situation that caused my first remembered embarrassing moment. It was at one of many fittings that I was caught with my pants down, actually. Either through rushing in changing out of my school clothes or in the excitement to get there on time I had forgotten to put on another pair of underpants. Gus and I had done numerous fittings for his mother so we had no qualms to fitting the outfits; on the other hand, on me removing my clothes I realized that I was standing there completely naked. To exacerbate matters further her youngest daughter Glenda appeared in the doorway and stayed there while looking continuously downwards at me. Not knowing her and only making the acquaintance of her brother because of the play lead me to suspect that her increased curiosity at other fittings was because she had not seen any other naked boy before except for her brother. And although she would peer through the window or doorway at other fittings she never ever saw me completely naked again. When I was at the dating age, Glenda and I use to frequent the movies together were we use to hold hands. We also use to attend dances together at St Mary of the Angels Hall, where after I use to walk her home. And yes we kissed and cuddled and mentioned my embarrassing moment. Enough said! That recollection brought back other innocent boyish curiosities. Because it was a co-ed school with up to thirty of us cramped up in one small classroom made for close contact, especially with the long desks seating six. The desks were that compact in the seating with its box like structure that it kept us pinned in our seats, and with it also up against each other meant having to climb over the other pupils to go to the toilet. Maybe there was method in their madness because seated that way we couldn’t muck about much. Some of us boys did muck about though without the nun teacher’s knowledge, for it was in that situation we always had a good look up the girl’s skirts as they clambered over us. The following years saw boys and girls vying to sit at the back of the classroom because of the two-seater desks, which were flip top desks where behind it stolen kisses were the games played then. We even found time to muck about while doing school homework together when at each ones homes straight after school, especially when it was only we that were there. While we boys would come up with spin the bottle, postman’s knock or truth or dare, the girls would at times seem to be more daring in wanting to show themselves off. They would line up to do the cancan, and of course it was much to us boys delight to see them try to see who could kick the highest, but it was all done in good fun. Other games that also involved both sexes were outdoor ones in our neighbourhood street. “Drie blikkies” (Three tins) is an indigenous game that was played by children in South Africa when the PlayStation or TV wasn’t invented. The game starts off by stacking three cans/tins on top of each other and someone aiming a ball to throw the cans/tins down. Once the tins/cans are down or have fallen, the person who threw the ball will try to throw out a person who attempts to re-stack the cans/tins. The main aim of the game is to stack the three tins/cans back up without getting thrown out with the ball. Bok-bok-staan-styf (Goat-goat-stand-stiff) involves two teams. The members of one team stand bent over in a line against a wall while the other team jumps on their backs as far forward as possible and then hang on for dear life. The lead bent over player has to then guess how many of the other players are on their backs. If guessed wrong, the opposition have another go, and if the pack collapses they also have another go. Any number of people in a team would play Kennetjie. The kennetjie (a piece of wood tapered at both ends) is placed on the ground in a circle drawn on the ground, and the end is hit with another piece of wood that would make the kennetjie rise up and be hit again as far as possible. The opposition would then pick a leader who would try to return the kennetjie into the circle in the same manner, and if not the other team would do it again. There was also mounted tug of war where we would be seated on each others back, and with us as mounted opponents grasping opposite hands we would pull and tug to unseat each other. With us boys it was a real rough and tumble game that we loved to play. And then it changed for us boys because the much older girls in our street wanted to join in too by being the ones for us to mount on their backs, which because they were more sturdy on their feet it became more difficult to unseat each other. On the other hand, our boy’s free hands that would be held other times onto the neck or chest to hold onto became a necessity at times to hold onto the girls breast so as not to be pulled off. Methinks, and so did the rest of my young mates then, that there were times when they used the ploy that we were chocking them when holding a bit too tight around their necks and they would then place our free hand onto their breast instead. There was method in their madness because they introduced another method to play the game. They would change their positions to the opposite side, whereby your free hand would then be holding onto the other breast. Of course boys being boys we just loved it and would compare notes after. The dream that set the neighborhood alight.